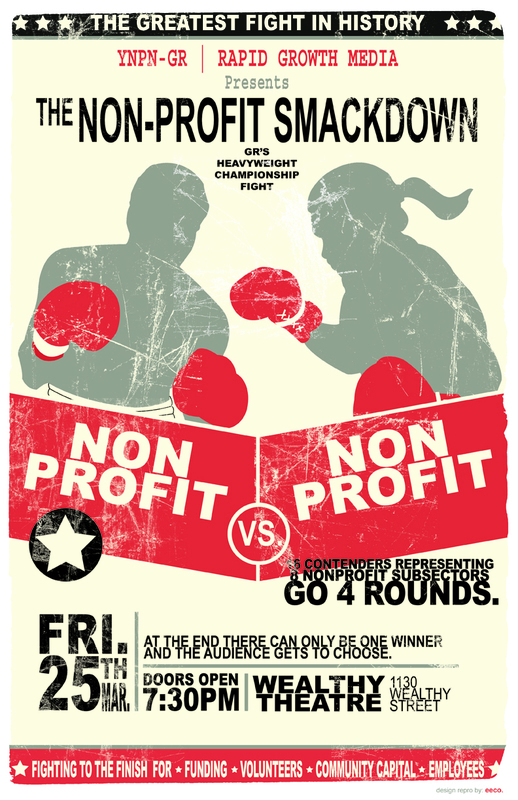 Last night we held the Nonprofit Smackdown. With a crowd of around 160 cheering them on 16 contenders from 8 nonprofit subsectors took the Wealthy Theater by storm. From the first round till the last the surprises never stopped. The Arts and Cultural sector contenders kept it real with a rousing 2 minute story about the arts saving lives and the local YNPN contender streaked through the audience as national and local members chanted Y-N-P-N in unison. Environment stayed into the last round but Hunger and Homelessness eventually won out. Granted, there were a few surprises I was in on, including the $500 donated by the Grand Rapids Community Foundation. During the last round we pitted Hunger (Kids Food Basket) and Homelessness (Coalition to End Homelessness) against each other, asking the audience to choose which organization would receive the grant. After cheering their hearts out for an hour for BOTH organizations the audience was torn and stepped up with an amazing solution: instead of choosing they would match the grant from their own pockets….. The audience proceeded to spontaneously donate over $1,280 (plus the $500 from GRCF), bringing the total to be donated to both organizations to $1780 ($890 for each organization). The feeling of goodwill was amazing and the feedback from participants and the audience was phenomenal. We could not have planned a more inspiring conclusion. The organizations on stage reminded us all how vital they are to our communities. Thanks to ALL of the contenders who save the day……. everyday. To watch a bit of the TV interview with Fox 17 check out this link.Our fantastic event partner Rapid Growth Media put this little ditty together.